Letter from Jaffe to Lankes about the life of an artist, a paragraph about Sherwood Anderson's upcoming memoir (published in 1942), and Jaffe's desire to gift one of Lankes' paintings to a colleague. Jaffe, Louis I. 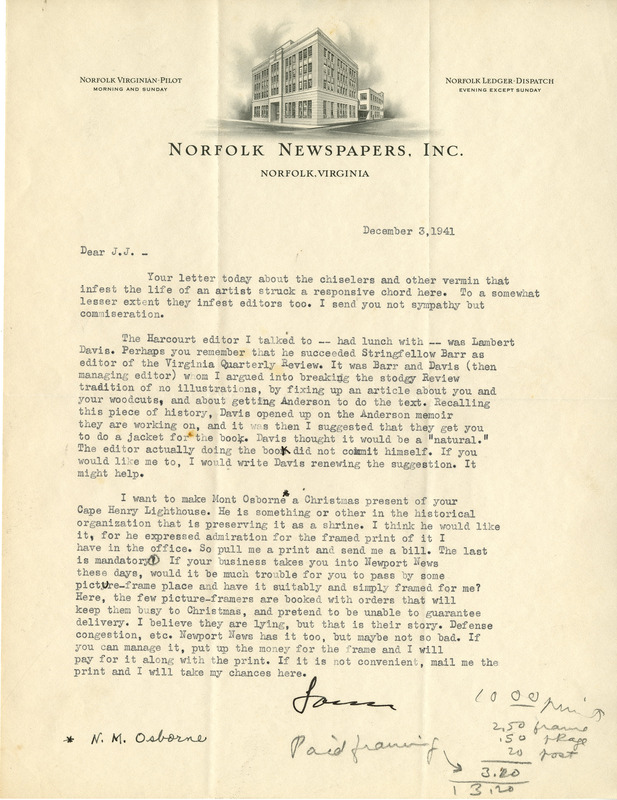 (Louis Isaac), 1888-1950, “Letter, Louis Jaffe to J. J. Lankes, December 3, 1941 (Ms2019-014),” VT Special Collections Online, accessed April 23, 2019, http://digitalsc.lib.vt.edu/Ms2019_014_JaffeLankes_/Ms2019_014_JaffeLankes_B1F1_JaffetoLankes_1941_1203.